Demi Lovato makes her way out of the Rose Bowl while leaving the Beyonce concert on Saturday night (May 14) in Pasadena, Calif. 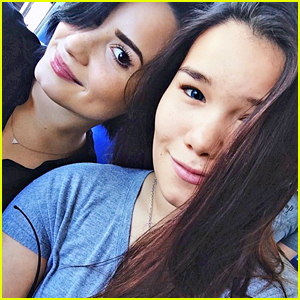 The 23-year-old singer met up with her younger sister, Madison de la Garza, for the Formation tour stop after performing at Wango Tango just hours before. “There are no words to describe what me and 90,000 people just witnessed and experienced! The Queen is alive and killin it!!!! Absolutely blown away!!!!!! Can we do it all again tomorrow please?!?! #amexaccess #rosebowl #queenbey #lemonade???? #formationworldtour #inspired,” Julianne wrote on Instagram after the show. Demi Lovato is none too happy with Stalker Sarah. The 23-year-old “Stone Cold” singer lashed out at the 20-year-old super fan on Instagram after a private incident with her family. Demi went off on Sarah, who is a staple around Hollywood, getting selfies and hanging out with all of your favorite celebs, days after Sarah was seen hanging out with her younger sister, Madison de La Garza. “GET A JOB. STAY AWAY FROM HER,” were some of the comments Demi made on Sarah‘s posts. JJJ doesn’t know what the problem is, and we probably won’t uncover it. WHAT DO YOU THINK about Demi’s comments? Demi Lovato keeps it comfortable in sweats while leaving a pilates class with a friend on Sunday (January 31) in Reseda, Calif.
Later that day, the 23-year-old singer visited a wolf sanctuary with her boyfriend Wilmer Valderrama for his birthday! 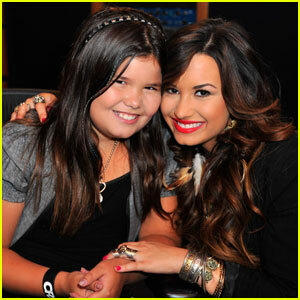 Her sister Madison De La Garza also came along. 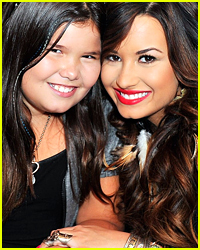 A happy birthday is in order for Madison De La Garza! She just turned 14 years old today (December 28) and her sister Demi Lovato took to Instagram to write a sweet message for her. Gemma Styles shows off her crown in this brand new feature for Paper mag. The 25-year-old sister of Harry appears in the issue along with other celeb siblings, including Frankie Jonas (brother to the Jonas Brothers), Aliana Lohan (sister to Lindsay), and Madison De La Garza (sister to Demi Lovato). Gemma on something no one knows about her: I’ve never drank anything from a can… I have a phobia that it will cut my lip that I can’t get over. Frankie on what he does in his spare time: Sometimes when I’m bored, I read Frankie Jonas fan fiction. More often than not it gets pretty weird. Madison on her favorite shows: The last shows I binge-watched were Jane the Virgin and How I Met Your Mother… my two favorite shows ever. EVER. Ali on dating apps: I’ve seen my friends use Bumble once and it seemed kinda sad, haha. Just swiping them away in the trash like it’s not an actual hu-man? Not my thaanggg. For more on these celeb siblings, visit PaperMag.com.